It was just a random arrow that killed Ahab in the end. It wasn’t any act of courage or talent by the Ammonites, or even losing after a heroic fight. Ahab was just picked off like the ordinary man he had disguised himself as. 2 Chronicles 18:33 An Aramean soldier, however, randomly shot an arrow at the Israelite troops and hit the king of Israel between the joints of his armor. … The battle raged all that day, and the king of Israel propped himself up in his chariot facing the Arameans. In the evening, just as the sun was setting, he died. So Micaiah the prophet was proven right: Ahab died in the battle. Ahab didn’t need to die (then). He could have accepted Micaiah’s prophecy as a warning, repented before God, and decided not to go into battle, but he foolishly thought he could do what he wanted, as long as he didn’t look like a king. 2 Chronicles 18:37-38 So the king died, and his body was taken to Samaria and buried there. Then his chariot was washed beside the pool of Samaria, and dogs came and licked his blood at the place where the prostitutes bathed [where Naboth was stoned to death], just as the Lord had promised. If you know your English history, it’s hard not to think of another king who lost to a random arrow. 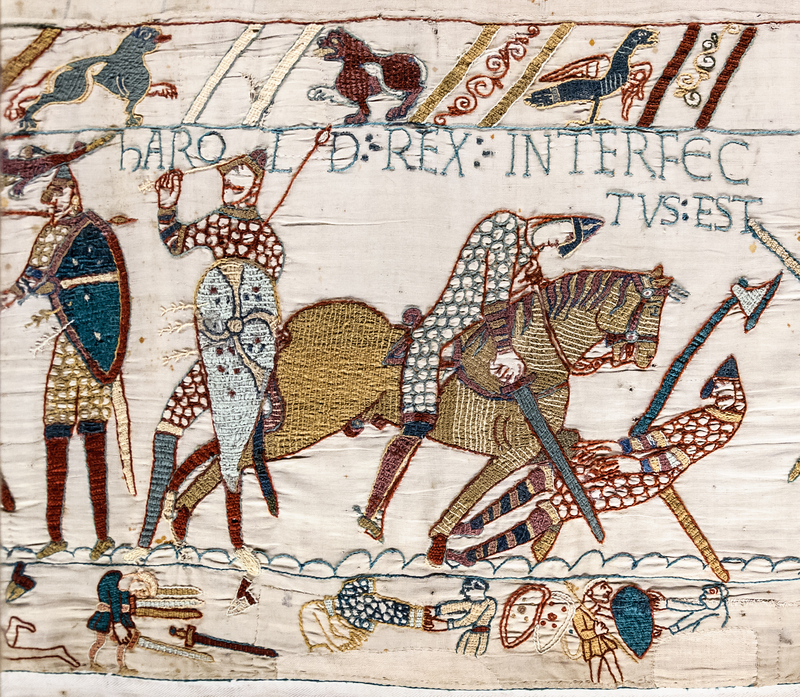 Ahab wasn’t the only one to die by a random arrow: the English lost the Battle of Hastings in 1066 when their king, Harold II was the victim of a random arrow. Showing someone as having died with a weapon through the eye was an indignity reserved for liars in the medieval times.